Fall is nature’s most glorious season! You may notice that strip of maples turning gold along your commute to work this year. You might see some pops of yellow or red over the fence in your neighbour’s backyard. This autumn palette is exciting and beautiful…and it’s best seen from high above! 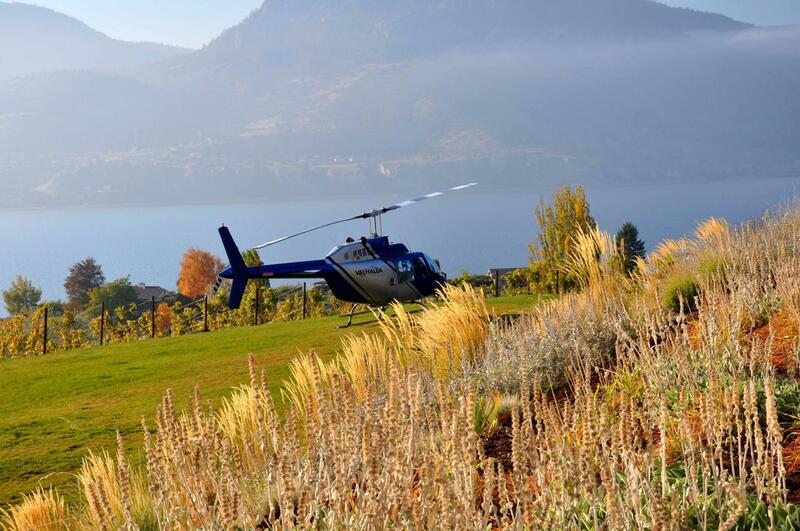 Here at Valhalla, we’re pretty fortunate to be able to get an all-encompassing view of the Okanagan’s stunning fall colours every day along our aerial commute! Do you love the changing leaves as much as we do? We know where to find the most awe-inspiring oranges, reds, yellows and greens. Join us for a one-of-a-kind tour this fall (and don’t forget your camera!). Well, it’s a greenway in the spring and summer, but this time of year, it should be called the “Flameway”! Bold yellows and oranges line the pathways, and their picture-perfect leaves blanket the ground. Native shrubs in deep burgundy and bright red mingle among the dark green Oregon grapes. Following the creek line from Okanagan Lake up through Scenic Canyon, all the way to Layer Cake Mountain is like tracking a colourful snake in the lush grass. Standing guard over Kelowna, this region offers exceptional hiking and biking, as it rises dramatically above Kelowna’s southern borders. But from above, the perspective is completely different: a vast carpet of trees; a few thoughtfully-implemented logging areas; stone outcroppings and fire-scorched plains; high peaks and hidden valleys. In the fall, spots of bright yellow appear among the evergreens like flashbulbs. Mother Nature’s paparazzi? Nope. Just the Okanagan forests’ new growth poplars making themselves (spectacularly) known. The apples and pears have been picked, and the tidy rows of trees now extend into ribbons of orange and cinnamon cutting across the hillsides. This brilliant stage doesn’t last long, but it’s worth every short second. Tucked in along the western shores of Okanagan Lake, you’ll find a narrow strip of fall colours. The historic Fintry Estate is landscaped with lush native plants that turn fiery as the weather cools: low, spreading sumac, red-stemmed dogwood, and the incredible bright red burning bush (yes, you read that right)! Combined with the steep falls and heritage buildings, this is a landscape painting come to life. Kal Lake is world-renowned for it’s stunning, gem-like colour combinations that range from jade green to turquoise to sapphire to emerald. Once the weather turns and the lake temperature drops, it’s harder to see the myriad colours in the water, but this time of year, there’s a short window of beyond-belief tones. The water still shimmers in variations of aquamarine, and the entire lake is ringed with bright yellows, golds and greens: a red-carpet-worthy jewel right here in the Okanagan. Grapevines. They love the ideal weather here in the Okanagan, and we love to look at them (and, you know, enjoy their fruit –but not while piloting a helicopter!). 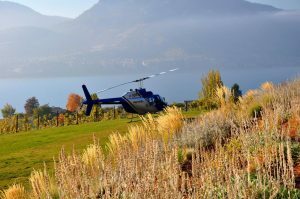 We regularly fly guests over the extraordinary Naramata and Skaha Bench vineyards, and even drop in on some of the region’s best wineries. It’s a sight to behold any time of year, but in autumn, the view from above is truly spectacular. Each grape varietal experiences the season in its own vibrant hue! Running from the beaches to the foothills, amazing waves of red, gold, yellow and purple vines create a kaleidoscope of beauty. These days, the sun glows warm and low in the sky, perfectly illuminating all of the beautiful BC foliage. The summer traffic has calmed, and you’re back into a routine. There’s no better time to enjoy a picturesque and colourful local getaway on high! Contact Valhalla Helicopters to arrange for a truly memorable (and chromatic!) autumn flight. « Back To School: How Do Helicopters Work?